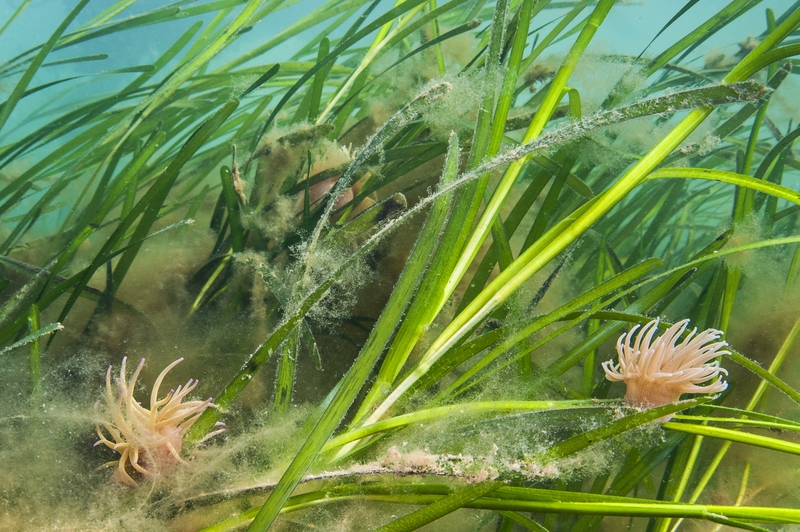 Seagrasses colonized the sea on at least three independent occasions to form the basis of one of the most productive and widespread coastal ecosystems on the planet. Here we report the genome of Zostera marina (L.), the first, to our knowledge, marine angiosperm to be fully sequenced. This reveals unique insights into the genomic losses and gains involved in achieving the structural and physiological adaptations required for its marine lifestyle, arguably the most severe habitat shift ever accomplished by flowering plants. Key angiosperm innovations that were lost include the entire repertoire of stomatal genes, genes involved in the synthesis of terpenoids and ethylene signalling, and genes for ultraviolet protection and phytochromes for far-red sensing. Seagrasses have also regained functions enabling them to adjust to full salinity. Their cell walls contain all of the polysaccharides typical of land plants, but also contain polyanionic, low-methylated pectins and sulfated galactans, a feature shared with the cell walls of all macroalgae4 and that is important for ion homoeostasis, nutrient uptake and O2/CO2 exchange through leaf epidermal cells. The Z. marina genome resource will markedly advance a wide range of functional ecological studies from adaptation of marine ecosystems under climate warming, to unravelling the mechanisms of osmoregulation under high salinities that may further inform our understanding of the evolution of salt tolerance in crop plants. Olsen, J. L., Rouzé, P., Verhelst, B., Lin, Y.-C., Bayer, T., Collen, J., Dattolo, E., et al. (2016). The genome of the seagrass Zostera marina reveals angiosperm adaptation to the sea. NATURE, 530(7590), 331–335.